Kyoto is packed with famous attractions and World Heritage Sites, but it’s also filled with quiet spots that are almost unvisited by tourists. Indeed, many of these are right next door to the famous places and, because they’re usually uncrowded, they’re often more enjoyable than the better-known places. 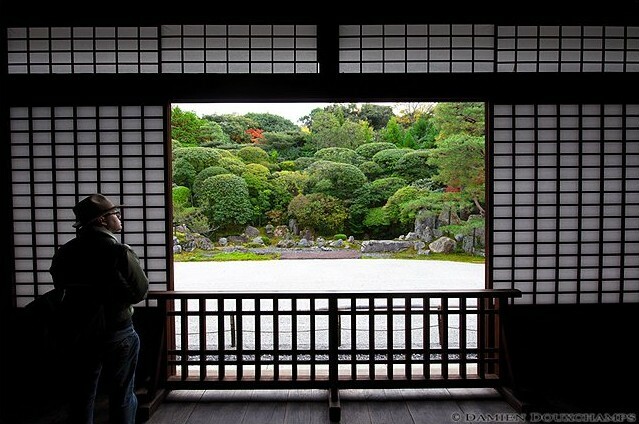 Seeking out Kyoto’s hidden gems is one of my favorite ways to spend a day in the Old Capital. Despite all my better instincts, I’m going to take the risk of introducing some them here. I’ve put them into convenient half-day itineraries to make visiting them easier. After each walk, I list some accommodations that are convenient to the walk. For more information about quiet places in Kyoto, see our Kyoto Two-Day Off The Beaten Track itinerary and How to Escape the Crowds in Kyoto pages. 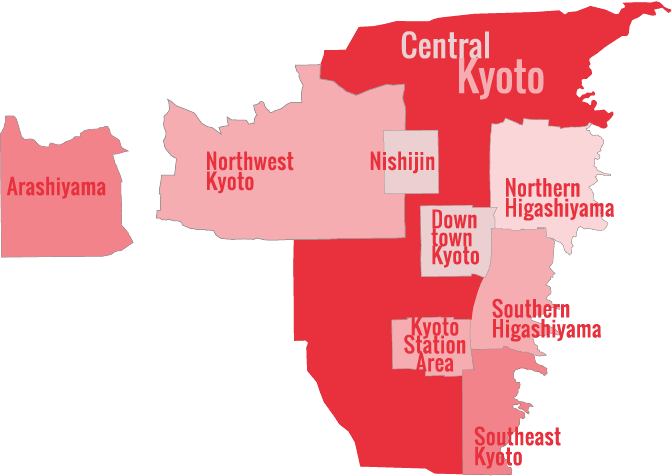 If you’re in Kyoto during cherry blossom season or Fall foliage season, see our Kyoto Cherry Blossom Off The Beaten Track itinerary and Kyoto Fall Foliage Off The Beaten Track itinerary. Murin-an Villa: Start by taking the Tozai Subway Line to Keage Station and walk down the hill past the International Community House. You’ll see a koban (police box) on the corner – turn left here down the hill. Just before Hyotei Restaurant, take a right down a narrow lane. You’ll find the entrance to Murin-An Villa on your right. The garden at this former private villa is quiet and superb. Konchi-in Temple: Leave Murin-An and retrace your steps to the koban and cross the two main streets in front of you, heading toward Nanzen-ji Temple and the mountains. Just before the main gate of Nanzen-ji, you’ll see some steps up to the right, leading to a smaller gate. Walk through this and a few more steps will bring you to Konchi-in Temple, which has a superb garden. Tenju-an Temple: Exit Konchi-in and make your way back to the main street and turn right and walk through the gate into Nanzen-ji. Walk up the hill past the public bathroom. When you are roughly even with the towering San-Mon Gate, look to your right and you will see the entrance to Tenju-an Temple. 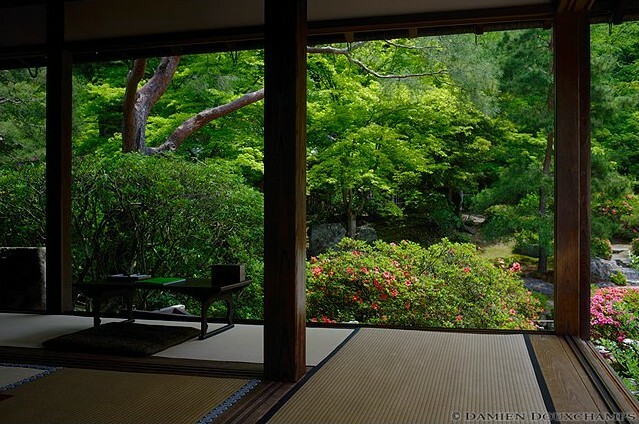 This subtemple has a fine garden that is usually ignored by both Japanese and foreign tourists (to their loss). Honen-in Temple: Leave Tenju-an and cut across the main grounds of Nanzen-ji and exit via the north side. Follow the road around, past a high school and Eikan-do Temple and you’ll soon get to a turning with a sign for the Path of Philosophy (Tetsugaku-no-Michi). Follow the Path of Philosophy north for about 15 or 20 minutes and as you approach the north end of the path, you’ll see a sign pointing up the hill for Honen-in Temple. Follow it to get to Honen-in (take a left at the top of the hill and you’ll soon come to the entrance). Enjoy this wonderful quiet temple. Yoshida-yama Mountain: Leave Honen-in and return to the Path of Philosophy, where you take a right (heading north). You’ll soon come to the busy approach to Ginkaku-ji Temple. Take a left here (on Ginkaku-ji Michi) and walk west to the intersection with Shirakawa-dori. Cross Shirakawa and head west (downhill) on Imadegawa-dori. After about 250 meters, a small road will come down from the left and immediately after that, you’ll see a bright orange Shinto shrine gate (torii). Walk through this and climb the pathways up to the top of Yoshida-Yama Mountain. There’s a lot to see up here, including three shrines, a park (great for kids) and two nice temples on the far side of the hill. When you’re done exploring, return to Imadegawa-dori, where you’ll find a bus stop where you can catch buses downtown and on to Kyoto Station. Shoren-in Temple: Take the Tozai Subway Line to Higashiyama Station and exit to Sanjo-dori. Walk east (toward the mountains) on Sanjo. When you come to Jingu-Michi, turn right and walk up the hill (heading south). After a small rise, you’ll see a temple with some enormous camphor trees out front. This is Shoren-in Temple. Enter the temple and enjoy the garden (after viewing it from inside, don your shoes and explore via the footpaths). Entoku-in Temple: Exit Shoren-in and turn left on Jingu-Michi (heading south). You’ll pass the enormous San-Mon Gate of Chion-in Temple on your left and then come to the gate to Maruyama-koen Park in front of you. Cut south across the park, walk up the hill, go straight for a bit and take your second right and then a quick left into Nene-no-Michi. After about 150 meters, you’ll see the steps leading up to Kodai-ji Temple. Ignore these and look to your right, where you’ll see the entrance to smaller and quieter Entoku-in Temple, which you should enter and enjoy. Ishibei-Koji: Exit Entoku-in and walk another 50 meters or so south on Nene-no-Michi and you’ll come to the entrance to a narrow pedestrian-only lane. This is Ishibei-Koji, the loveliest little lane in the whole city. Follow this. After you pass Uemura Ryokan, take a left and follow the lane out to the larger auto road. Take a left on this. It climbs a hill and then intersects with a road where you turn right (down the hill heading west). You’ll soon come to the very large Higashioji-dori. When you reach Higashioji, look across the street and just slightly to your right and you’ll see a large stone Shinto shrine gate (tori). This is the entrance to Yasui-Konpira-gu Shrine. Enter this. Yasui-Konpira-gu Shrine: Follow the flagstone approach to Yasui-Konpira-gu and you’ll soon find yourself in front of the main hall, where you’ll see a huge rock covered with pieces of paper. This is the en-musubi/en-kiri stone, which is believed to have the power to bind lovers together or break them apart, depending upon the way they pass through the hole in the stone. Try it, if you dare. Then, walk north out of the north entrance to the shrine (not the way you came). And take a left on the road you reach after about 100 meters. Follow this east. At the corner, you’ll see the entrance to Kennin-ji Temple. Kennin-ji Temple: Enter Kennin-ji and be sure to pay the admission fee to see the superb and simple Zen garden here. After enjoying the temple, exit the way you came in. When you get to the main road, turn left and walk north. This is Hanami-koji, which runs right through the heart of the Gion geisha district. When you reach Shijo-dori, turn left and a few minutes of walking will bring you to Gion-Shijo Station.